« Bathroom of the Month – March 2011 – Slice the Perfect Food! At lunchtime, I stare at my coworkers’ unfinished sandwich crusts and try not to say, “Are you gonna finish that? Cuz I could put it to good use…” I keep trail mix in my desk drawers. I eat two breakfasts. Two. Once, on a date, I ate more than my companion. “I see you eyeing that extra piece of pizza,” he said. “Why don’t you just eat it?” I did. There wasn’t a second date. I don’t have a tapeworm (at least I don’t think I do). What I do have is a triathlon team: the Full Throttle Endurance training team. I haven’t been training with them for long, but it’s made an impact on me and my appetite. I was on the track team in both high school and college. 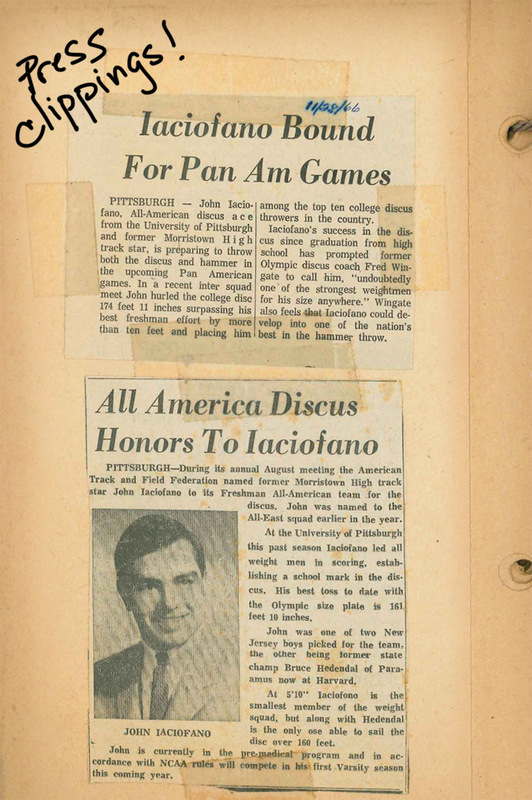 I did some running, but my main event in high school was the discus (inherited talent from The Box – see below image). In college, I threw the hammer instead, but at 5’6″ and 130 lbs that line of work was going nowhere for me (and yes, I just announced my weight on the Internet). It wasn’t until about 5 years ago that I started running regularly. I never entered any races, but just ran for myself: my sanity and my health. It wasn’t until last year that I ran an actual race. I ran the Brooklyn Half Marathon in May of 2010. I finished the 13.1 miles in 1:41:40, a time I was happy with for my first race. To address problem #1, I hired a swim coach: Kacey, a recent NYU graduate and member of their swim team. On our first lesson, she told me to jump in the water and show her how I swam. So I did. I couldn’t swim two laps of the pool. “That wasn’t…so…bad….” she said. I always admired her positivity. But she straightened me out and eventually I was able to swim the half mile without stopping. 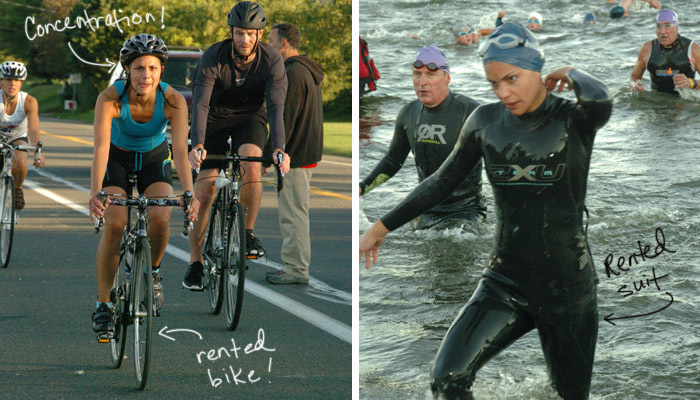 The night preceding the Montauk Triathlon was a terrifying experience for me. I slept a total of three hours, listening to the wind howl Wuthering Heights style around my hotel while the ocean waves crashed loudly right outside my door. But once I heaved myself in the water (thankfully a warm temperature), I stopped being afraid and started laughing at the whole situation. The water was a teeming mess of swimmers going in the same general direction but completely disorganized. Like cats swimming! People above me, below me, poking me in the ribs, kicking me in the head, spraying pond water in my mouth. So I started laughing. And then I started elbowing people out of the way. My final time was 1:24:52. Afterward, I promptly fell asleep in my hotel room still wearing all my gear, including my number. In November, I managed to get into the NYC Triathlon through the lottery. 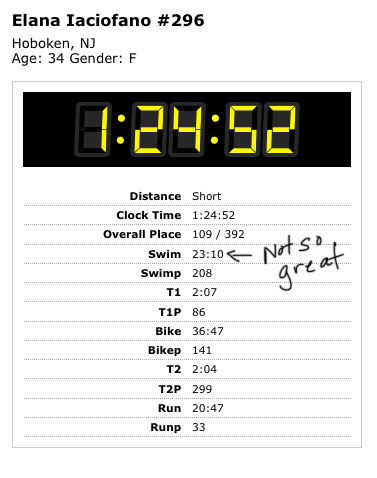 I had no idea how to train for an Olympic distance race (1 mi swim, 25 mi bike, 6.4 mi run). 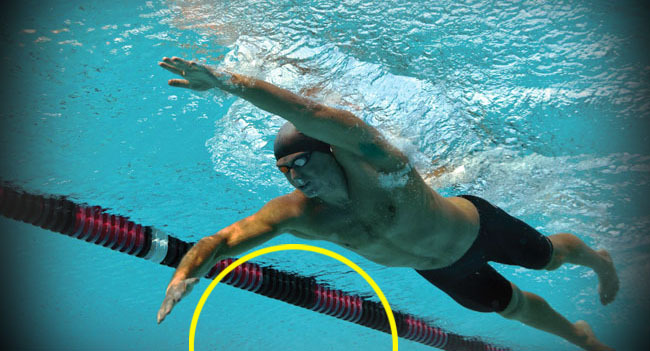 My training efforts involved swimming at Chelsea Piers Gym where I would frequently see a team of experienced swimmers tearing through the pool like a group of synchronized dolphins. These people terrified me, not only because they all demonstrated what appeared to be an effortless skimming through the water, but because they all shouted and cheered and generally made a LOT of noise during the whole process. At 6 o’clock in the morning. Simmer down. I have to constantly remind myself that I’m just beginning and that I need to be patient: skill will come with time. Hopefully. And my bathroom has turned into a sporting goods supply closet. 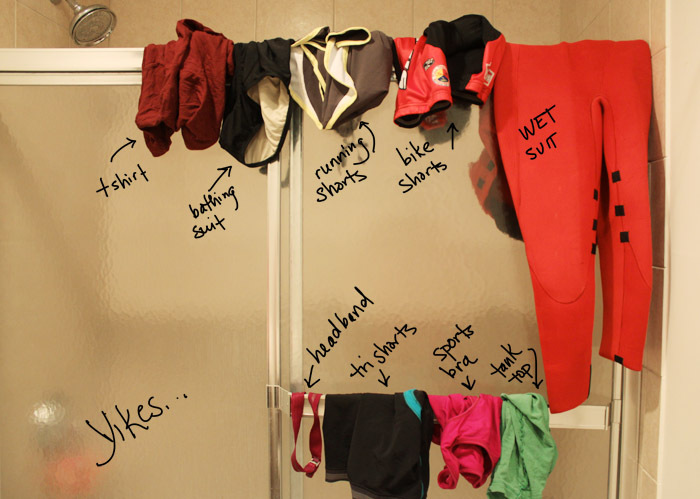 At any time, there are bathing suits, swim caps, bike shorts, assorted spandex, t-shirts and sports bras thrown over the shower door. See the photo below for evidence. I would put the stuff away, but I’m usually too tired at the end of the day. I go to sleep at around 9pm because I wake up at 4:15 am in order to get to practice on time. And when I wake up at 4:15am, I’m hungry. I need some energy in the form of calories if I’m going to attempt to keep up with what my brother calls “my merry band of athletic maniacs.” So I need something in my stomach before I set out for the morning workout. I am a big supporter and eater of Clif Bars. 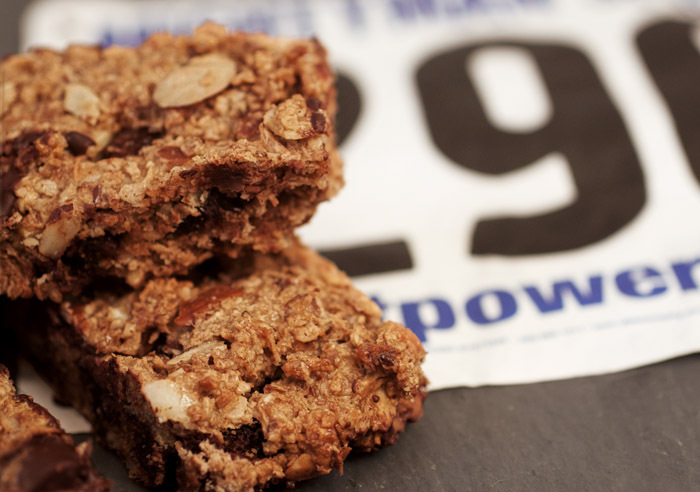 But if I can, I prefer making my own food, and I wanted to make my own energy bars too. Plus, it’s always entertaining to see just how badly I can mess up my kitchen with the latest culinary experiment. Heat up your oven to 35o degrees. On a cookie sheet, spread out the 1 cup slivered almonds and 1 cup shredded coconut and toast. The coconut will toast more quickly than the almonds. It will only take the coconut about 5-7 minutes to toast. At this point, you can either toast the almonds for a longer amount of time or take them out of the oven as well. In a large mixing bowl, put in your toasted and cooled almonds and coconut, and all the rest of the dry ingredients (don’t add the almond butter, agave or egg whites just yet). Give everything a good mix. Then add in the 1/2 cup of almond butter and the agave syrup, and mix it thoroughly. I used my hands to do this, it just worked a bit better than a spoon or spatula. Separate two eggs, and add in the whites, mixing until well-combined. Line a cookie sheet (the kind that has sides) with parchment paper. This will make it much easier to remove the bars once they are baked. Spread the bar mixture onto the parchment lined cookie sheet – a wee bit more than a 1/4 thick. Once you’ve removed them from the oven and given them time to cool, you can cut them into bars. 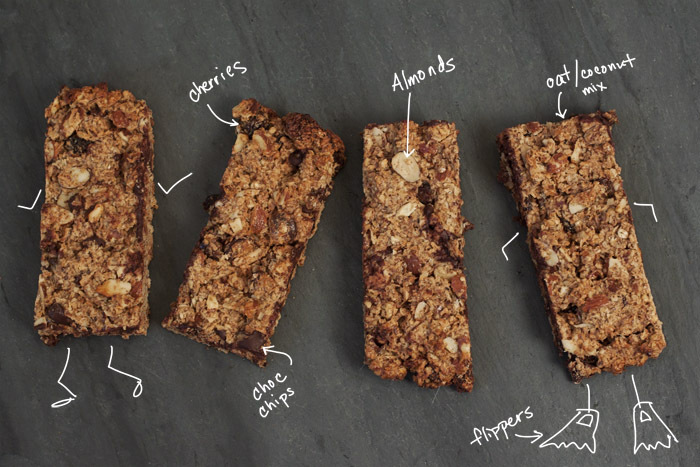 This recipe makes 14 large bars or 28 smaller ones. I prefer the smaller ones, as they are pretty packed with ingredients, so you might not need to eat a whole bar at a time. Problem #3: There will be no room for sanity in my carry on with all the homemade energy bars I’ll be bringing along. It’s nice to see someone as obsessed with food as I am. I haven’t been down to the city to train with the team in a while, but hopefully this summer we’ll meet and we can talk about future creations. I wonder how your bars would be if you added in some superfoods like spirulina, maca root powder, wheat grass powder, beet powder, chorella, kelp, etc. Most of these minimally alter the taste though add a huge energy and nutrient boost. Also, have you ever tried cooking at a lower temperature like 250 degrees and for a longer time to keep it “raw”, preserving most of the nutrients? The bars looks delicious. I hope to try one soon. I would love to use those ingredients, but I’ve never practiced much with them. Maybe when we meet you can give me some tips!